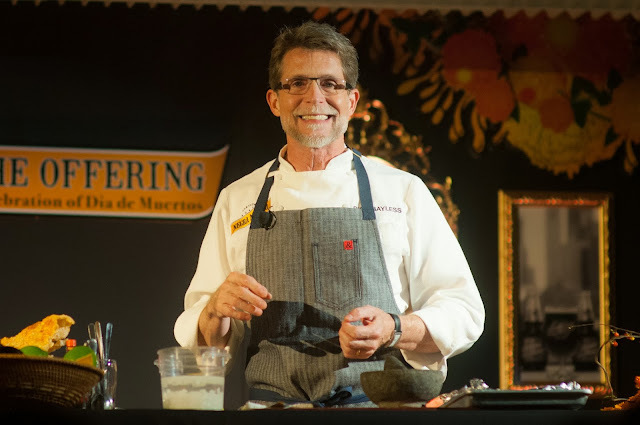 Negra Modelo and Chef Rick Bayless invited me and a guest to a private event celebrating Dia de Muertos at Kendall College. I knew it would be a great event that both my husband and I would enjoy… I mean who doesn’t like drinking Negra Modelo while cooking and eating Mexican food or celebrating dia de muertos. 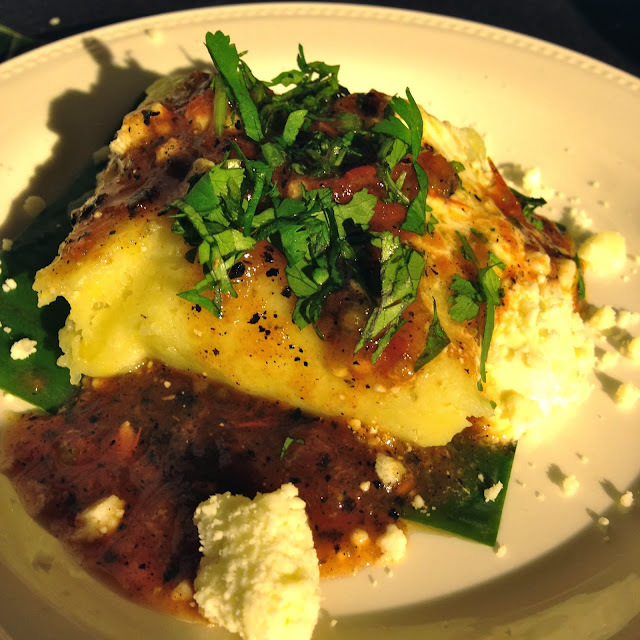 It compliments the flavors of Mexican cuisine perfectly. It also reminds me of my annual trips to Mexico, and the joy of drinking a Negra Modelo while basking in the sun on the warm beaches, or washing down an incredible gordita or tamale en el centro de Ixapan de la Sal. Chef and I have met on several occasions so it was nice to catch up with him, especially with the recent news that he is opening another restaurant in my neighborhood. 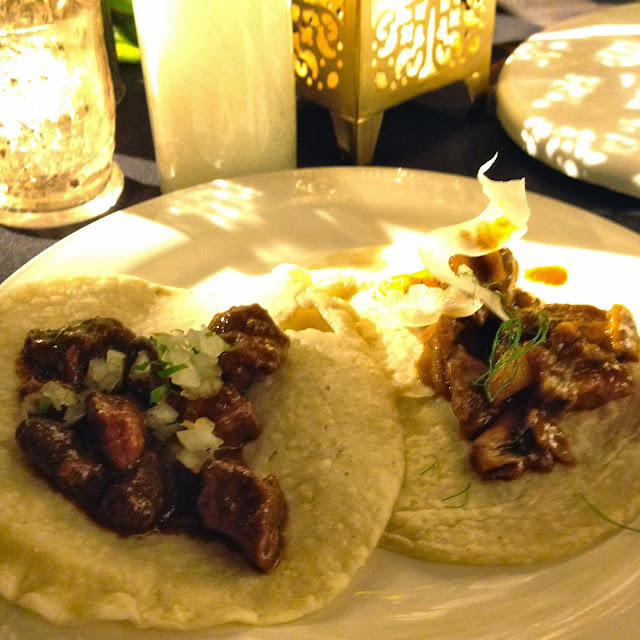 Furthermore, I was heading to Mexico City a few days later, and Chef Rick provided me with some of his favorite spots to eat. He really got me excited for all the great food coming my way on this trip and he gifted me his cookbook, Frontera, with a nice hand written note. I can’t wait to try the recipes in it, especially the margarita cocktails for my next taco night party! I also got to hang out with some of my lovely Chicago foodie friends, Kelly Rizzo of Eat Travel Rock and Annie Colvin of Aasquared. We mocked, the popular TV reality show series, Real Housewives in the photo as the RHONM (Real Housewives of Negra Modelo). Next, we were surprised with a mariachi band. It was a magical performance! I adored the beautiful attire and melodies. Everyone then headed into the dining room for more Negra Modelo, cocktails, and delicious bites (we got to nosh on consume de pina, guacamole, elotes, and taquitos) in anticipation of the cooking demo by Chef Bayless. The flowers and décor for the offering were breathtaking. 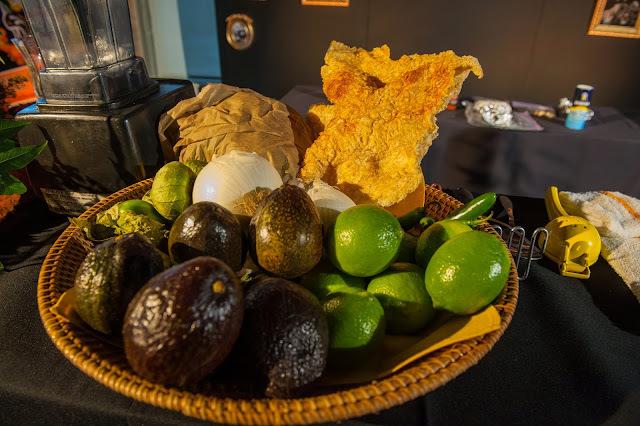 The demo offered a roasted tomatillo guacamole with crunchy chicharron. 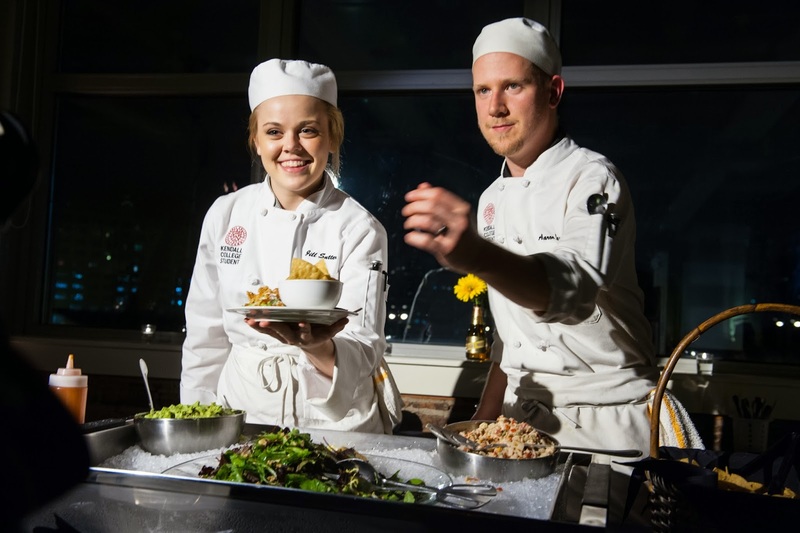 Chef Rick was very engaging and made his guests laugh. He offered some great tips on making guacamole, picking tomatillos, and the proper usage of jalapenos. 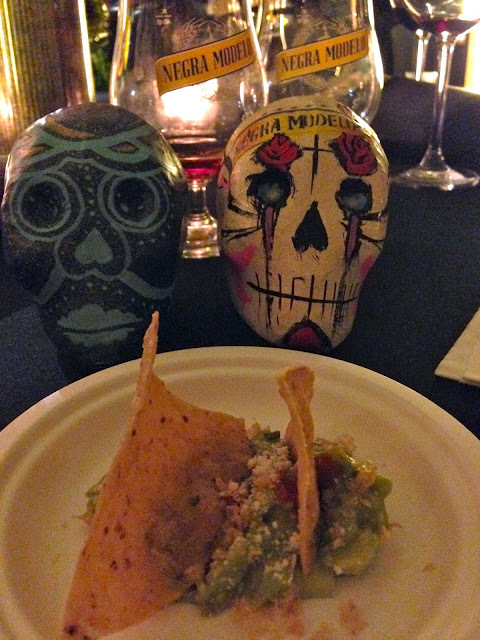 After the demo, we were served feast as an offering for the dia de muertos. The room was set up with several stations serving ceviche, tamales, and tacos. The taco station had someone pressing fresh corn tortillas, which you couldn’t pass up. The dessert table offered three delicious authentic Mexican sweet treats, postres. Some were even gluten free! 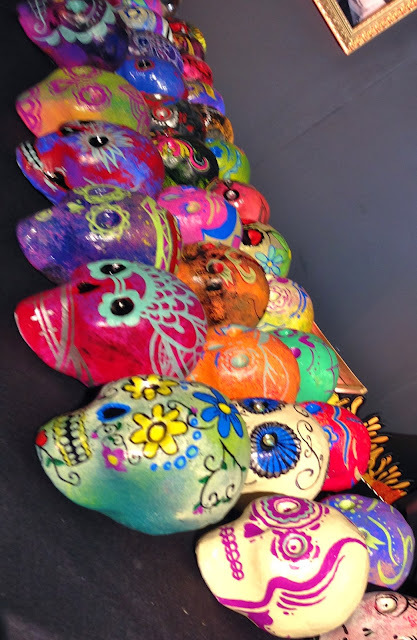 During dinner, a sugar skull artist was providing customized skulls in honor of the celebration. I am obsessed with them, they are beautiful! 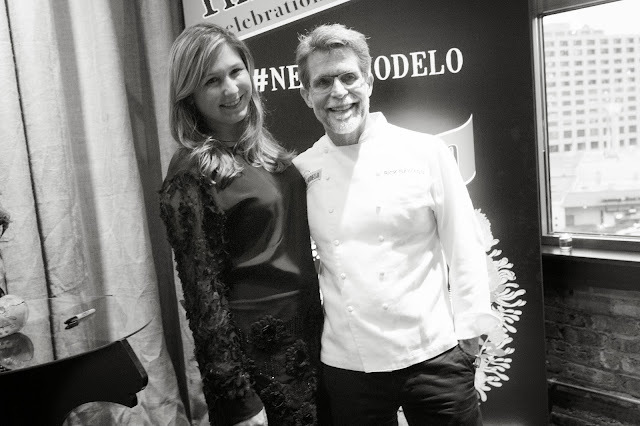 I had a wonderful and intimate night with Chef Rick Bayless, and I scored some awesome swag as a gift bag from Negra Modelo. What a great night and I hope to be invited next year! Gracias a Negra Modelo and Chef Rick Bayless, me disfruta mucho!! Roast the tomatillos on a rimmed baking sheet about 4 inches below a preheated broiler until soft and blotchy black on one side, about 6 minutes, then flip and roast the other side. Cool. Scoop the tomatillos onto a cutting board, leaving most of their juice behind. (They’ll have softened to the point of almost falling apart.) Chop them into rough 1⁄4-inch pieces and scrape them into a large bowl. Mash the avocado flesh in with the tomatillos: Cut the avocados in half, running a knife around the pit from top to bottom and back up again. Twist the halves in opposite directions to release the pit from one side. Scoop out the pit, then scoop the flesh from each half. With an old-fashioned potato masher, large fork or back of a large spoon, coarsely mash the avocado and tomatillo together. Rinse the chopped onion under cold running water, shake off the excess and add to the bowl along with the lime juice and cilantro. Stir everything to combine, taste and season with salt, usually about 1 teaspoon. If not serving right away, cover with plastic wrap directly on the surface of the guacamole and refrigerate. To serve, chop the chicharrón into 1⁄4-inch pieces (as a variation I sometimes “shave” the chicharrón into shards by thinly slicing it) and sprinkle it over the guacamole. Drizzle with the hot sauce and sprinkle with the cheese. WoW Kat! Now that sounds like an awesome and colorful event! You lucky lady! I bet it was a blast!